Snyder Hill is a peak with modest elevation but big peakbagging importance in the northeastern side of Washington. Despite its name, Snyder Hill is no ordinary hill. Snyder Hill is Pend Oreille County's Greatest Prominence Point (CoGPP). In addition, with 2480' of prominence, the mountain is Washington's 83rd-most prominent peak. These prominence facts make Snyder Hill a worthy destination for avid peakbaggers. Despite Snyder Hill's importance to peakbaggers, the mountain tends to be an afterthought for most people. The peak has been logged many times over the years, although the slopes regularly contain young evergreen forests. The summit currently offers no outward views, although it once was home to a fire lookout. The peak is relatively low-elevation in relation to many nearby peaks and is commonly overlooking, although it is one of the closest and easiest summit destinations to the towns of Ione and Metaline. Snyder Hill does have some historical significance in the region. As mentioned above, a fire lookout once stood atop the summit. The fire lookout was a 10' tall L-4 tower constructed during the mid-late 1930s. 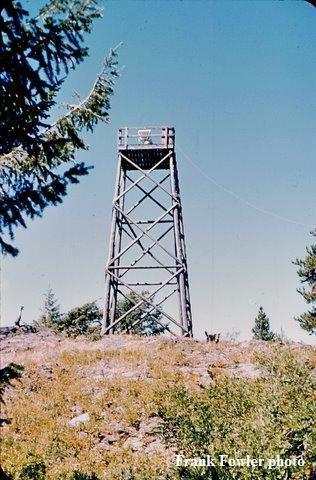 A platform patrol tower was also contructed (at ~5350' elevation) on the mountain, within 0.25 miles due west of the summit. The summit lookout tower was destroyed in 1958, but the patrol tower stood for several more decades before being torn down. Few remnants remain from the towers, most notably the concrete base of the former patrol tower. To see a photo of what the patrol tower looked like, visit this link. Many maps and resources show the summit elevation as 5426', but that is incorrect. Topography maps clearly show a closed-contour at the summit that has the summit elevation range between 5440' and 5480'. The elevation is probably much closer to 5440' than 5480'. A USGS Benchmark was placed at the summit in 1992, and is found atop an unnatural pile of rocks at the summit. A yellow-colored "Land Survey Marker" is found on a tree at the summit, as well. 1) Turn east onto Sullivan Lake Road (Forest Road #9345) and cross Ione Bridge over Pend Oreille River. 2) After 1.4 miles from Highway 31, turn left (north) onto an unmarked Forest Road, which is actually Forest Road #050. 3) After 8.7 miles along Forest Road #050, turn right (east) onto an unmarked spur road. This road junction is approximately at: 48.78143° N, 117.34761° W.
NOTE: For reference purposes, Forest Road #050 gets very rough/unused beyond this road junction. 4) Drive along the spur road for approximately one mile until its end. The spur road is single-lane with few turnaround locations, but the road-end should have plenty of room to turnaround large trucks. 1) From the road-end, begin hiking/bushwhacking ESE to the summit. Some people might prefer first heading south up to the summit ridge and then east to the summit, while other people might prefer side-traversing uphill along the north side of the summit ridge until reaching the summit. The first option allows hikers the possibility of seeing the old patrol tower remnants on an open area, while the second option might be quicker to reach the summit. Roundtrip Hiking Distance: 1.0-1.25 miles with ~400' elevation gain. There are at least two other possibilities for driving to the upper slopes of Snyder Hill, on the north side of the mountain, but those options are not recommended for reasons such as extremely rough and/or decommissioned roads, not reaching as high of an elevation as the roads mentioned for the standard approach, or both reasons. Snyder Hill can be summited year-round. No fees or permits are required. Forest Road #050 is always open to non-motorized outdoor enthusiasts. However, the road might be closed to motorized use at any time. There is a gate 2.7 miles up Forest Road #050, marking the furthest point that hunters are allowed to drive. Beyond the gate, along the upper sections of the road, is designated as "Disabled Hunter Road Access Area". High-clearance vehicles should be able to drive all the way to the spur road-end. Passenger vehicles might be able to drive at least to the spur road, but definitely not recommended beyond that road junction, although the last three miles of Forest Road #050 prior to that road junction have several berms and dips in the road which might damage or bottom-out low-clearance vehicles. The nearest established campgrounds are at Sullivan Lake, on the northeast side of the mountain. Those include Noisy Creek Campground, Sullivan Lake Campground, and Mill Pond Campground.